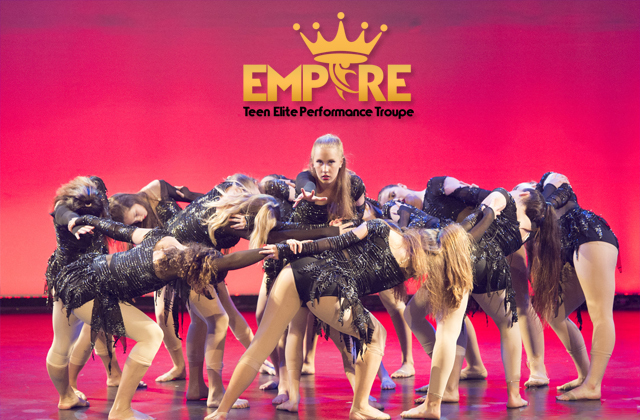 The Empire Teen Elite Performance Troupe is for committed, hard-working and enthusiastic performers who want to kick off their performance careers and gain valuable industry experience outside of the studio. Entry into this troupe is by audition or invitation only, and members of this troupe will be considered for special opportunities within WAPS to help them gain an insight into the world of performing arts and entertainment industries in Perth. Troupe members must fulfil requirements (see below) and commit to attending classes each week. Some extra rehearsals may be required prior to performances, and if students are not able to attend all required classes there may be restrictions on their participation. Empire members work hard, both in and outside of class, demonstrating a positive attitude and constant motivation to work to achieve their goals. WAPS will support Troupe members whether their goals are extra-curricular performances at a professional industry level, completing specialist secondary or tertiary training in dance and the performing arts, or building a career in performance and entertainment. This class is fun, fast-paced, challenging, and designed for students who love performing and are hungry to experience new styles and genres of dance and performance. The Empire is open to students from 17 and under. Dancers should be committed, reliable and dedicated, as well as willing and able to perform at external events. Empire training covers choreography only, as such it is required that students take other WAPS classes to develop and maintain their technique and skills. It is a compulsory requirement that all dancers in this class must also be enrolled in at least one Ballet class (or Lyrical/Contemporary, upon application), one Modern Jazz class, and one other dance class at WAPS (TST highly recommended). Troupe members are also expected to rehearse and train outside of class, including regular practise at home to help retain choreography learned in class.